It has long seemed like augmented reality exists in virtual reality’s shadow. The idea of visiting fully virtual worlds separate from our own has long captured the public’s imagination and taken precedence over the “augmenting” of our existing world. On the other hand, augmented reality has long held many practical applications in enterprise environments, such as industrial manufacturing. This could lead to users familiarizing themselves with the technology on the job, potentially leading to an upsurge of consumer augmented reality usage at home. Technology research firm Gartner predicts that virtual reality will reach mass adoption by 2020 to 2023, whereas it predicts mass adoption of augmented reality a few years beyond that. That means it will potentially be a decade before we see large-scale adoption of augmented reality, which seems a logical conclusion. Both virtual reality and augmented reality have technical issues to solve. Augmented reality shares almost all the same issues virtual reality experiences but has the additional issues to solve of computer vision for detecting real-world objects, unique display form factors on transparent displays (if not using a video camera as pass-through), digital object placement, locking digital holograms in place within the real world, and much more. Augmented reality’s biggest attempt to catch up to virtual reality and step into the limelight of public consciousness may also prove to be one of the biggest issues it has to contend with. To experience virtual reality, users must buy extra peripherals, such as costly headsets and computers to power them. The addition of augmented reality to standard mobile devices immediately puts a form of augmented reality into hundreds of millions of users’ hands. However, that experience of augmented reality is far less than optimal. The engineers at Apple and Google have done an astounding job of bringing an augmented reality experience to devices not built primarily for that purpose, but most consumers’ initial experience with augmented reality will be one that is limited to what a mobile device can deliver. As the saying goes, you never get a second chance to make a first impression. If users have a low-quality augmented reality experience on their mobile devices, they may broadly associate that experience with augmented reality in general and dismiss the technology entirely as only as advanced as what a mobile augmented reality experience can provide. They may then dismiss the myriad of other form factors that exist to deliver a potentially superior augmented reality experience. The solution to the “first impression” issue is an issue of its own. Although a number of augmented reality headsets and glasses appear to be in development, only a select few are available for purchase in 2018, and most are targeting enterprise, are “developer editions,” or in general are not ready for public consumption. Plus, unlike virtual reality, for which a number of low-cost headsets are available, augmented reality headset/glasses hardware can easily cost thousands of dollars, which puts them out of the reach of all but the most dedicated innovators or early adopters. This cost differential can help explain why augmented reality’s mass adoption is estimated to be a few years farther out than that of virtual reality. Augmented reality, and augmented reality headsets specifically, exist very much within the early stage of adoption, the Innovators stage. It can be challenging for technologies to overcome the hump of Early Adopters and cross the chasm to reach the Early Majority consumer adoption stage. The best hardware in the world means nothing if it isn’t accompanied by amazing software. The public seems intrigued by the promise of augmented reality, but many are not quite sure what they would use it for. Many people understand the benefits of virtual reality, because being able to put yourself in a fully virtual world has been explored in relative depths by popular media. Augmented reality, on the other hand, has remained a bit more under the radar, making it hard for the public to envision how it will be used. This can be a chicken-or-the-egg scenario. Software developers don’t want to build software for hardware that hasn’t reached certain consumption levels, and consumers don’t want to purchase hardware that doesn’t have a broad base of applications for them to use. Users need a compelling reason to purchase these devices. It will likely take a few enterprising software developers creating some “must-have” applications that will drive consumer adoption. Although the road for those software developers will not be well traveled, the ones to create the first “killer applications” for aug will be handsomely rewarded. There already exist a number of augmented reality applications that show off just what augmented reality is good at. One of the biggest features of augmented reality is the ability to place digital objects in the three-dimensional, real-world space. Placing an object is moderately simple to do using a real-world marker to indicate where the object should go, but the ultimate goal of many augmented reality applications is marker-less tracking. The example below shows an example of marker-based augmented reality. Marker-based augmented reality requires a specifically designed marker to be placed in the real-world space for the cameras/computer vision to orient themselves to. 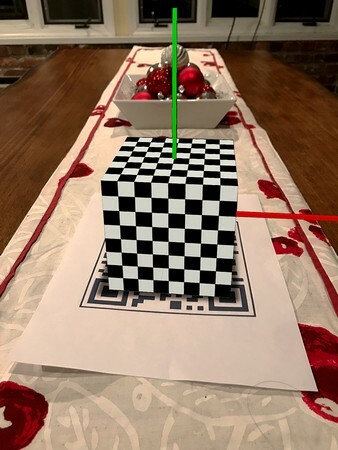 In this example, a paper printout of a QR code has been placed on the table, and the augmented reality software places the digital hologram of a cube on top of it. Marker-based augmented reality can provide a very solid base to track from, because the computer vision doesn’t have to be as sophisticated as marker-less tracking. It just has to recognize the marker. One of the terms you’ll hear thrown around when discussing augmented reality is computer vision. Computer vision is a broad field of study, but in the context of augmented reality it typically describes how a computer can understand the environment it’s seeing via digital image or video. Computer vision that can handle marker-less augmented reality is technologically difficult because it requires a complex understanding of real-world 3D space. Our brains can view a scene and easily distinguish among a wall, a window, and a doorway, but a computer will just see a collection of pixels, with no one pixel more meaningful than the other. Computer vision describes how a computer can take a collection of pixels and understand what they mean. For example, given an image of a table, computer vision would allow the application to not only recognize it as a collection of pixels, but also identify it as an object in 3D space with a height, width, and depth. Even on systems that can do the processing required for marker-less augmented reality, there can be delay while the processing occurs. Some augmented reality devices are quicker than others at processing the environment (with HoloLens performing notably well in this regard), but many augmented reality devices suffer from some amount of tracking latency (delay). Move your mobile device or change your head position quickly enough, and you may see some shifting of the digital holograms placed in physical space, even on the best of the current-generation devices. In the real world, though, if you observed a chair changing position or sliding across the floor when you turned your head, you would assume your house was haunted. These tracking issues are still a common occurrence in augmented reality experiences today. Getting tracking correct is one of the biggest challenges augmented reality faces, but one that will go a long way toward maintaining the illusion of a user’s digital items existing in the physical space. Expect the next generation of devices to make tracking a priority and improve upon the current generation of tracking technology. Field of view (FOV) refers to the space in which digital holograms can appear. For example, the FOV for mobile augmented reality is the amount of viewable space on your device screen. The device screen acts as your window into the augmented reality world. Look away from this window into the digital, and you would only see the real world, where no holograms exist. On some current augmented reality headsets/glasses, the digital FOV typically covers only a very small area within the visor or glasses, not the entire viewable area. This gives the effect of gazing into the virtual world through a small window or letter slot. Similar to looking through a letter slot, the holograms would only appear in the area you mark as hologram visible. Any part of the hologram that falls into the area you mark hologram not visible would be cut off at that point. As you can see, a headset with a narrow FOV has a much more difficult time offering the same level of immersion as a headset with a larger FOV. Obviously, a larger FOV is preferable to a smaller one. If the holographic images display only in a small window, it’s easy to be pulled out of the experience as you see the holograms get cut off within your FOV. Meta 2 appears to have the largest FOV of the current batch of headsets, claiming a 90-degree FOV, but all have a long way to go before approaching the FOV of the human eye (approximately 135 degrees vertical and 200 degrees horizontal). Improving the FOV of the augmented reality experience figures to be one of the next big leaps for augmented reality to make with its next generation of hardware. In fact, Microsoft has already announced that it has found a way to more than double its current FOV for its next generation of HoloLens, which would be a great step toward solving the biggest complaint most people have with the HoloLens. Like the current generation of virtual reality headsets, current augmented reality headsets struggle to meet the high-resolution demands consumers are accustomed to. Additionally, many current augmented reality devices suffer from poor occlusion (the effect of an object blocking another object). In augmented reality, occlusion typically refers to physical objects obscuring digital ones. You may have noticed this issue in augmented reality mobile apps such as Pokémon Go: Sometimes, you’re able to create a very realistic scene with Zubat hovering above the ground; other times, Squirtle appears to be half-stuck inside a wall. Such visuals are due to lack of proper occlusion in augmented reality. When occlusion is properly executed, digital objects can be accurately and realistically placed in any relationship to real-world objects — under them, partially behind them, on top of them, or whatever the simulation requires. The HoloLens and Meta 2 devices can perform a reasonable degree of occlusion, and Magic Leap’s demo videos appear to show a very high level of occlusion (though because the device has yet to ship as of mid-2018, it’s hard to predict if the production device will be able to reach the high bar set in its video demos). 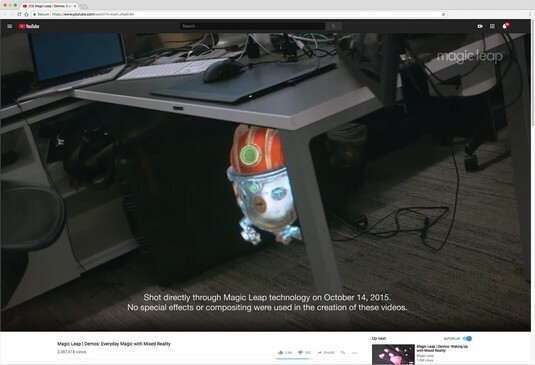 The image below displays a screen shot of the occlusion Magic Leap displayed in one of its early demo videos. The digital hologram of a robot seamlessly is occluded by the top and side leg of a table. If Magic Leap is able to replicate this fidelity of graphics, combined with this level of occlusion in its mass-consumer device, it will be a massive step forward for augmented reality. It may not seem like much, but think about it in terms of the marker-less orientation. In order to place the robot behind the table leg, the simulation software has to understand the 3D space and not just see a collection of pixels. It needs to view the scene and be able to calculate what should be in the foreground, what should be in the background, and where the digital hologram should fit into all this. It needs to understand what “under the table” means and know which parts of the table are farther forward in space than others. That is not easy to achieve. For augmented reality to deliver a quality experience on a mass consumer scale, solving occlusion for dynamic environments will be an important issue to iron out.